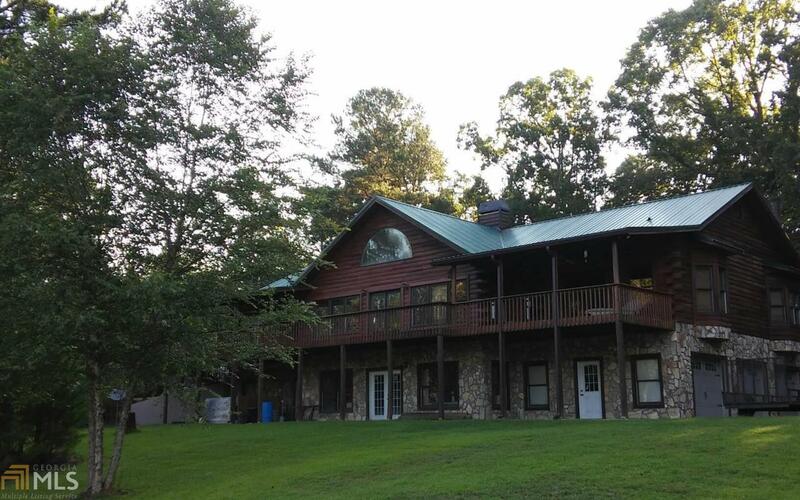 Huge log cabin with lots of land and a beautiful view! Newly renovated kitchen, travertine tile, granite counter tops & stacked rock accents, built-in stemware & bottle rack, Whirlpool appliances, large island with breakfast bar. Perfect for outdoor entertaining, too, with professionally landscaped pool yard, gazebo & firepit. Front porch & back balcony run full length of house, with view of pond & big backyard. Master bath totally remodeled, with separate shower, water closet, double vanity & brand new soaker tub, travertine tile & granite throughout. Livingroom has lots of windows, including arched window above french doors, beautiful hardwood floors, & efficient woodburning stove. Too many features to list all here! Must see! It's awesome! Listing provided courtesy of Key Real Estate Of Georgia Llc. © 2019 Georgia Multiple Listing Service, Inc. All rights reserved. Information Deemed Reliable But Not Guaranteed.